The successful user experience is about meeting a consumer’s needs on an individual level – a “segment of one” not “one-size-fits” all, many experts say. But what does that look like in practice? “What really differentiates companies is their personalization through data — which allows them to build unique experiences that lead to increased engagement and better outcomes, …” write Scott A. Snyder, president and CSO of Mobiquity and a senior fellow at Wharton, and Jason Hreha, founder of Dopamine, a behavior design firm, in this opinion piece. Today, design has a seat at the table. With the success of products like the iPod and the iPhone, businesses have realized that a good user experience is key for the bottom line. So where did things go wrong? Or more importantly, how can we get them right? Surprisingly, the answer does not lie with design. It lies with data. Netflix is an example of a company that pays attention to user experience. Early on Netflix chose not to charge late fees, like Blockbuster did, in order to help build its subscription DVD business. Netflix soon put Blockbuster out of business, but also came under threat from other online video streaming businesses like Sling and Roku. Fortunately, Netflix was able to use its viewing analytics to create personalized content recommendations, and even create its own shows geared toward viewer interests, such as House of Cards and Orange is the New Black. For Netflix, the user experience was the price of entry, and the viewing data they gathered and analyzed became the strategic advantage of the business. Because of their approach, we don’t order special TV/Movie packages anymore. Instead, thanks to Netflix analytics, we have our viewing experience tailored to who we are. This is one example of a new breed of data-driven user experiences created by companies like Amazon, Pandora, Sephora, Nike, Progressive and Disney. Good user experience design has become table stakes. If you don’t do it well, you can’t even get out of the gate in this hyper-competitive digital world. What really differentiates companies is their personalization through data — which allows them to build unique experiences that lead to increased engagement and better outcomes for the user and company. However, there is a fine line between “helpful” and “annoying” in the digital world, and the price of getting your data-driven personalization right or wrong may be the difference between a delighted customer and one who will never come back to your brand. Good user experience design has become table stakes. If you don’t do it well, you can’t even get out of the gate in this hyper-competitive digital world. How Can We Achieve Truly Personalized Experiences? There are three reasons why digital solutions fail to engage users long term and drive positive outcomes: segmentation, relevance and rewards. Are you someone who likes competition and rewards? Or are you someone motivated by helpful nudges from friends and family? Do you respond to text messages during work, or do you catch up on your personal messages at night? Do you travel a lot? Do you have a “wearable” (or are willing to use one)? These are the types of questions we should be asking our users. We can either ask them directly, or infer answers from user interactions and behaviors. People are all different — but you wouldn’t know it by looking at most digital products. The majority of applications create a one-size-fits-all experience that fails to engage even a fifth of those who sign up. The good news is that we have the ability to collect individual behavioral data from users so that we can segment them more accurately, and present them with experiences that speak to their unique experiences and preferences. In order to deliver relevant, impactful interactions at the right moment, we need to understand each user’s context. But context is much more than just time (when?) and location (where?). With richer data being collected from both users and third-party sources, context is now evolving to include situation (what am I doing?) and emotion (how am I feeling?). An expanded definition of context is shown in the figure above. With this multifaceted model of context, we move closer to the ideal “segment of one” (a unique profile for each user at a given point in time). You would not want to send weight loss content to a customer who is maintaining a healthy weight, or give a shopping coupon to a stressed out traveler in an airport security line. Context-aware applications like Google Now and Tempo AI (acquired by Salesforce) leverage a user’s calendar as a source of context, so that they know when a user may be busy, in a meeting or enjoying downtime. This information is used by these applications to adjust their content and experience to fit the context-determined mindset of each individual user. Context-aware applications like Google Now and Tempo AI (acquired by Salesforce) leverage a user’s calendar as a source of context, so that they know when a user may be busy, in a meeting or enjoying downtime. Most users are only willing to share their data if they perceive that they will get real benefits in return. More than 60% of consumers want real-time promotions, yet 67% don’t trust retailers with their data (Opinion Lab Survey, 2015). We have the opportunity to do better. In order to get, you have to give. Unfortunately, most applications ask for too much and offer too little. Twitter It’s common for apps to have a long-winded sign-up process that asks you every question under the sun. This is not a recipe for success. Popular applications like Waze and Pandora are case studies in proper information gathering. They provide us with immediate benefits right after we download their apps. Waze improves our driving route in exchange for our location. Pandora gives us a personal DJ, tailored to our tastes, in exchange for rating the songs we’re listening to. In both these cases, our effort seems minimal in comparison to the benefits we get back. Contrast this with the majority of digital solutions that ask for a lot of data (like registration, profile, location, etc.) before delivering one ounce of benefit. We have to “earn the right” to collect the type of data we need to appropriately segment users. We have to win the “benefit versus effort” trade-off with our users by providing them with immediate, tangible benefits and using the data being collected to further personalize their experiences. Eighty-six percent of mobile marketers have reported success from personalization — including increased engagement, higher revenue, improved conversions, better user insights, and higher retention. However, only 1.5% of apps personalize their experiences (Mobile Marketing Automation Report, VB Insight, July 2015). In order to get to true personalization, and deliver greater effort than benefit, we need to make our user-experience (UX) design data-driven. A traditional UX design process starts with user research followed by user flow creation, persona creation, storyboards/wireframes creation, and (finally) a graphical mock-up or prototype of the design. The desired result of this process is a single beautiful design that attempts to deliver the best possible experience to meet the needs of all the different user types. By knowing something about each user’s behaviors, motivations and contexts, we have the opportunity to deliver a variation of the core experience that is best suited to each individual user by using robust analytics and an adaptive user interface. But the reality is that all users are not the same — and they don’t all want to interact with your app in the same way. By knowing something about each user’s behaviors, motivations and contexts, we have the opportunity to deliver a variation of the core experience that is best suited to each individual user by using robust analytics and an adaptive user interface. In a data-driven UX approach like this, we start with the desired outcomes and behaviors we are trying to achieve with the target user base. We then develop an initial behavioral segmentation model, and identify the optimal interaction strategies and user experience for each segment. And finally, we use analytics and machine learning to have our system adapt over time, so we can further optimize the design and underlying interaction models. 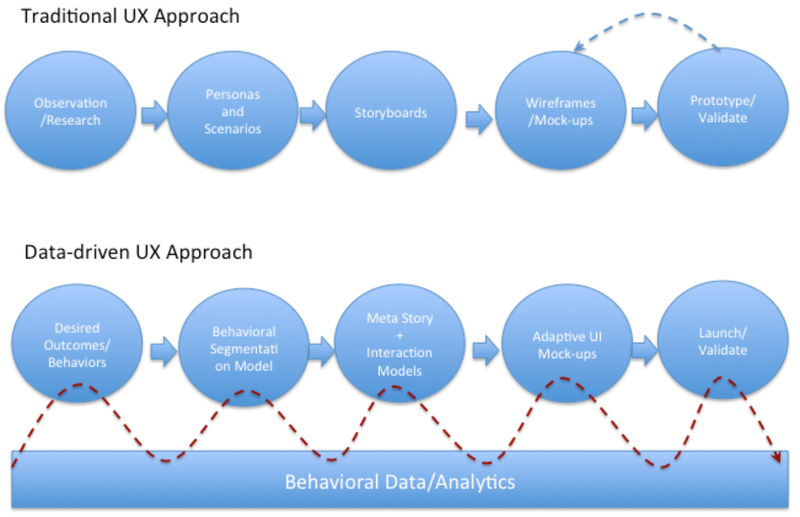 The figure below depicts the difference between a traditional and data-driven UX approach. Expand your definition of context beyond location and time. Situation and Emotion matter. Deliver immediate benefits to users before asking for more of their data. There is a fine line between useful and creepy. Segment your users based on digital behaviors, preferences, motivations and context to drive the most relevant interactions. Set up a big data and analytics environment capable of capturing and acting on behavioral analytics data in real time. Use analytics and machine learning to adapt the target interactions for each user-segment over time, based on user responses. Recruit a new breed of user experience designers—those with analytics skills to support the design of adaptive user experiences. Start with desired outcomes, then pilot and adjust quickly. It’s no longer good enough to know your customers. It’s what you do with that knowledge that really matters. Your customers are willing to engage and share their data if they perceive a real benefit for them. Are you ready to live up to your end of the bargain? Context is everything in both data and marketing. Having the right data at the right time and understand what options and opportunities there are for interaction can be informed by traditional analytics, and layering cognitive gives a shorter path to making the decision on which conversation to have. Great Article! I believe that data is the payload of all automated processes in the biggest possible sense of the word, and shifting the focus to Information in the IT discussion is how to move into the next generation of computing, communication, and commerce.